Lake Colby is unique in its easy public access, four access points (Saranac Lake Village Beach, Latour Park, State Boat Launch, and the DEC Environmental Camp and Education Center), and proximity to the Village of Saranac Lake. The largest economic activity in the Adirondack Park, the Adirondack Medical Center (AMC), fronts on the lake, giving patients a view of a delightful and quiet lake. However, Lake Colby is a fragile, spring-fed, lake that is environmentally threatened (see Water Quality). For these reasons the Lake Colby Association favors public uses on the lake that are non-threatening to the environment and create minimal noise pollution that would disturb residents and the patients at AMC. The Association's predecessor was formed in 1995 in response to water skiing events held on the lake that damaged shoreline property, disturbed patients at AMC and caused wakes that washed over loon nests. The DEC's 10HP launch limit was avoided by use of the Public Beach for these unexpected and unwelcome events. The forming members set limits on motor power on the lake as a priority. In 2001 the Village once again, through the Saranac Lake Chamber of Commerce, planned hydrofoil races on Lake Colby, once again circumventing the 10HP DEC limits. The LCA (with the AMC joining as both an LCA member and independently) vigorously opposed this event, asking for demonstrations of jurisdiction and proper permitting. The organizers discovered that needed permits had not been obtained and the races were cancelled. Extending the 10HP limit to ALL shoreowners became a priority. In early 2008, without prior notice, the Village approved auto races on the frozen surface of the lake. Both the LCA and AMC were made aware of these approvals after the fact and opposed the event as in the 2001 hydrofoil races, for all of the same reasons. We took our opposition to the press, to our elected officials, to the environmental advocacy groups and to the State through the DEC. The questions of authority over such events remains open and is being pursued by the Association, even though once again the organizers withdrew under withering opposition. From a policy standpoint, the LCA opposes ALL uses of high-powered vehicles on the lake and opposes the use of the Saranac Lake Village beach for anything other than its intended purpose without proper permitting and environmental reviews. We will gladly work with the Village in designing fun and tourist-attracting events that do not threaten the lake but will use every resource to protect the lake against inappropriate uses. The Saranac Lake Village beach on the Lake is directly opposite the Adirondack Medical Center whose front rooms overlooking the beach include those for maternity and terminally ill patients. Lake Colby, like many Adirondack lakes, gets unwanted runoff from roads. Lake Colby also gets runoff from two open-air sand and salt storage facilities in its watershed. The State contributes to this problem in two ways: First, it over salts Route 86, a "clear roads" policy adopted for the 1980 Olympics and never returned to the more natural packed-snow of earlier years. The result is dead trees along road-sides and heavy chloride loading of lakes and streams. Being so close to Route 86, Lake Colby is a particular victim. Second, the State built the straight-through culverts under Route 86 without any sedimentation basins or natural filters. Construction on Mount Pisgah has added to the runoff of sediments, many of which pass through these culverts. We are working with the Town and the Department of Transportation to remedy these defects with the addition of sedimentation basins and natural filters during any upcoming roadwork. 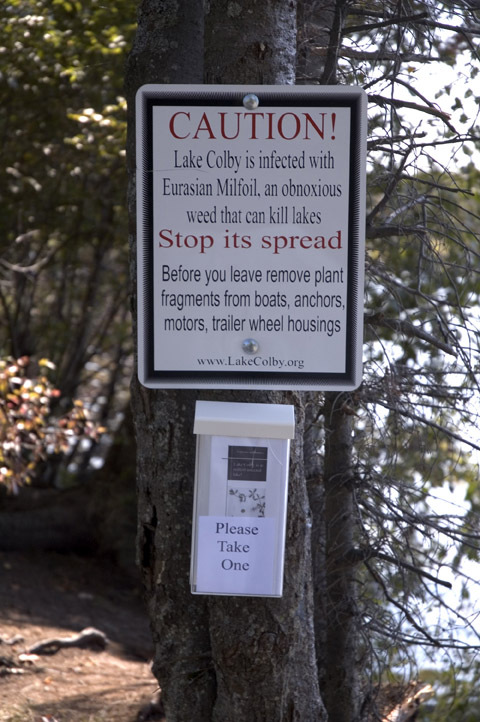 The Association believes that quarantining infected lakes is the only viable approach to control the spread of invasives. At present there are approximately 55 lakes of the 3,000 in the Adirondacks infected with Eurasian Water Milfoil (Myrophyllum Spicatum). New lakes are infected every year, always by fragments of the plant carried from infected lakes on portable watercraft. Suggestions that boat wash stations would solve this problem are illogical. Fragments trapped between trailer pads and boats cannot be accessed in a wash but float away on re-launch. NO boat from an infected lake should be re-launched without an official inspection. A permitting system could allow boats to freely transfer from infected to infected lakes, e.g., throughout the Saranac chain which is completely compromised today. Boats from uninfected lakes could similarly travel from uninfected to uninfected lakes without an intervening inspection. A system of two different colored permits would make these rules enforceable: orange permit holders would have to get a green sticker after inspection to re-launch in uninfected waters. Out of area boats could not launch in either infected or uninfected waters without a permit. While proposals such as this are being considered, only public education will work. Signage warning that boats should be inspected before launch are helpful, but signs that warn boaters that their boat is in infected waters and should be inspected on removal would be much better. Fines for boats found transporting invasive species would make this even more workable. Pamphlets instructing boaters how to inspect their boats and what to look for should be at every infected lake's public launch sites.